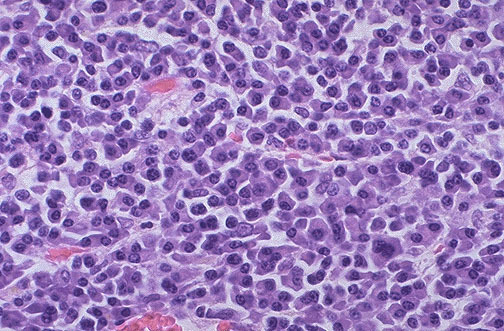 At medium power, the plasma cells of multiple myeloma here are very similar to normal plasma cells, but they may also be poorly differentiated. Usually, the plasma cells are differentiated enough to retain the function of immunoglobulin production. Thus, myelomas can be detected by an immunoglobulin "spike" on protein electrophoresis, or the presence of Bence-Jones proteins (light chains) in the urine. Immunoelectrophroesis characterizes the type of monoclonal immunoglobulin being produced.